This past summer (2017) was a banner-waving, happy-dancing time for me. I sold four picture books and only one of them was new. The other three had been around for some time and the the fingerprints of rejection were on them. And yet each one finally danced in glass slippers with his/her own prince.The fourth–the new one–came from a suggestion by the editor with whom I’d worked a long and successful time. I often ask myself why–why does one book get taken at once and another has to date a long while before a relationship clicks. Why one seems condemned to the dust bin, and then achieves an unlikely resurrection. And I think there is not one but five possible answers. And sometimes those answers combine in peculiar ways. 1. An editor has to fall in love. Has to desire the book. Has to feel its power. Wants to dress up that power, pass it on. This happened recently to a book David Harrison and I wrote a couple of years ago–THE LONELY TIGER. 2. An editor has to believe the book will be successful. This happened with a book my daughter Heidi and I wrote together–MONSTER ACADEMY which stayed with the same editor for eight years as she had us fiddle and change and make it work. It will be out next Fall. 3. An editor has a hole in his/her list, a niche, that the mss. nicely fills. Maybe not the best book on the list, but a necessary one. This has happened many times and besides, would I tell you which ones? It might be your favorite book. And then it would break your heart! 4. An editor moves, changes jobs, and the book fits better in its new abode. This happened to YOU NEST HERE WITH ME which after 12 years followed its original editor to her new place of business. My co-author, daughter Heidi and I did the happy dance. 5. The zeitgeist works in your favor, the market changes, a new trend happens, the stars re-align. And suddenly what was old becomes new and popular. 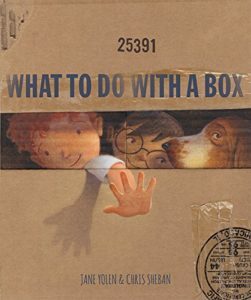 WHAT TO DO WITH A BOX comes out of the closet and becomes a hit. OWL MOON–deemed too quiet by five editors–meets a brand new editor who sees its potential. And 30 years later has become the benchmark for “small moments” for teachers and their students everywhere. The moral of this story is: Don’t give up. Don’t be afraid to try a book again. Be ready to spit-polish an old story. Shake it out of its doldrums. Look at it with fresh eyes. If you have children or grandchildren, go buy Jane’s books! Her Web site has 36 PAGES listing her astoundingly productive publishing career.